Fancy curling up on the sofa with a glass of mulled wine and a great read, but just can’t decide which one to choose? 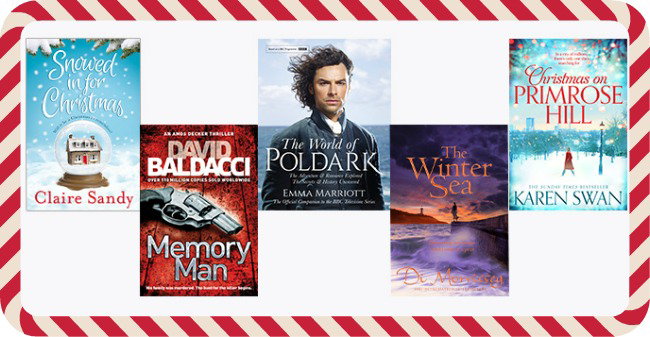 Let us help you out with our top five pick of the best books to get stuck into this festive season, and beyond. Twinkling lights brighten London's glamorous Primrose Hill as Christmas nears - but Nettie Watson isn’t after parties and presents this year. For Nettie, Christmas only serves as a stark reminder of the life she used to have. She made a promise, long ago, to never leave home, and so far she's stayed true to her word. But then, under the glaring spotlight of the world's media, Nettie is unexpectedly caught up in a 21st century storm. Her exploits make her a global name and attract the notice of one of the world's most eligible bachelors - famous singer, Jamie Westlake. The question is, now she has his attention, does she want to keep it? A sweeping saga of family and secrets set on the beautiful Australian south coast. Escaping to the country from her unhappy city life, Cassie Holloway moves to the little town of Whitby Point. Here she meets the Aquino family, whose fishing business was founded by their ancestor, Giuseppe, an immigrant Italian, some ninety years before. Life for Cassie on the south coast is sweet as she sets up a successful restaurant and falls in love with Giuseppe's great-grandson Michael. But when the family patriarch dies, a devastating family secret is revealed which threatens to destroy her dreams and Cassie's future happiness depends on her quest for the truth. Everybody wants it to snow at Christmas . . . Don't they? Asta's plane touches down in Ireland just as the first flakes of snow begin to settle. She fled her village years ago, with a secret hidden deep within her. That secret is now a feisty sixteen year old, desperate to meet her long-lost relatives. But when the weather turns what should be a flying visit into a snowed-in Yuletide with Asta’s chaotic, eccentric family, it soon becomes clear that there is more than one secret nestling with the presents under the lopsided Christmas tree. And might there also be a cure for Asta's long-broken heart somewhere in the Irish snow? As Decker comes to terms with the news, tragedy strikes at the local school. Thirteen teenagers are gunned down, and the killer is at large. Following the serious brain injury Amos suffered as a professional footballer, he gained a remarkable gift - and the police believe that this unusual skill will assist in the hunt for the killer. Amos must endure the memories he would rather forget, and when new evidence links the murders, he is left with only one option. A lavishly illustrated companion to the massively successful BBC television series based on Winston Graham's Poldark novels. Emma Marriott's The World of Poldark explores the characters, the compelling stories and the era that Winston Graham - and the television series - set out to recreate, the England that Ross Poldark returned to from the American War of Independence. England, and especially Cornwall, was then marked by social unrest and a deep division between rich and poor. It was a place of tin mines and shipwrecks, of new money versus old, of harsh justice and great kindness. And, above all, it was a place that inspired Winston Graham's beloved novels. Experience the great houses and the glorious landscapes and follow the cast of characters as their stories play out against the backdrop of Cornwall's wild beauty, through interviews with the actors, behind the scenes insights and in-depth information on costumes, props and locations. Packed full of behind the scenes photographs,The World of Poldark is the ultimate guide to the popular series.